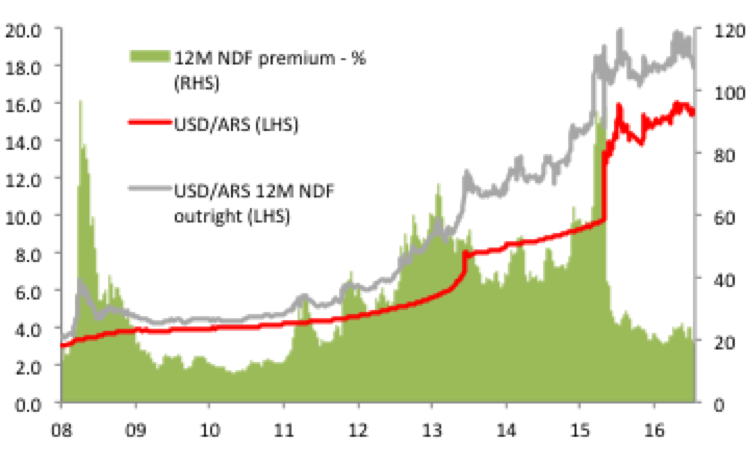 The Argentinian peso – a ~20% return, non-correlated trade. A climate of low yields and expansive central bank balance sheets has naturally complicated the pursuit of trades that can generate an expected annual return of ~20%. For this reason, we have been banging the proverbial drum regarding the opportunity for investors to be short-USD/ARS. 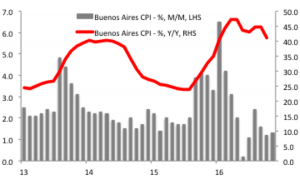 This trade is a direct beneficiary of the Argentinian government implementing – outside the auspices of the IMF – a classic stabilisation plan, one that requires monetary policy to be tightened such that it stabilises and strengthens an exchange rate following the ending of an unsustainable FX peg. The long history of EM financial crisis suggests that when a country implements this policy framework and as long as there is sufficient political will to absorb the hit to economic growth – which there is in Argentina – then investors can harvest the outsized risk premia that is usually embedded in FX forward curves. They can also often expect capital gains from currency appreciation. The market’s scepticism towards the ARS is fading and the currency is experiencing growing investor focus. While the subsequent appreciation of the ARS and leftward shift in the USD/ARS NDF curve has reduced the attractiveness of entry positions, a short-USD/ARS position still has the potential to deliver 15-20% returns over the coming 12 months. The appeal of a long-ARS position rests on the policy mix of the government of President Macri, who is attempting to restore the Argentinian economy from the ravages of years of populist rule. (Argentina – the return to policy orthodoxy and the opportunity to go long-ARS.) The legacy of populism was an enlarged budget deficit (which rose from a surplus of 0.4% of GDP in 2008 to a deficit of -6.6% in 2015), which required heavy central bank monetisation and which in turn led to an escalation of inflation. (Chart 1.) The pegged exchange rate was highly over-valued, and was defended by steady FX reserve depletion and an increasingly complex array of exchange and capital controls, which distorted economic activity. Private sector economic activity was impeded by an uncertain regulatory climate, by the crowding-out of private investment by government borrowing and by a banking sector which faced curbs on interest rates which undermined the process of financial intermediation: Argentinian bank credit/ GDP measures just 15% of GDP. To add to this adverse economic backdrop, Argentinian economic statistics were an early progenitor of a “post-truth” climate we now live in, whereby much economic data was rendered meaningless by political influence. Exchange rates. The web of capital and exchange controls has been removed, the unsustainable USD/ARS-peg has been broken and the ARS was allowed to float. (On 17th December 2015, USD/ARS rose 36.1% 9.80 to 13.3). Domestic liberalisation. The financial repression that dominated banking sector activity has been rolled-back, with a view to enabling an efficient process of financial intermediation to be a source of growth to the private sector. Fiscal policy. 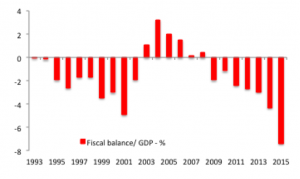 Fiscal policy is being tightened with a view to reducing the degree to which the government is forced to resort to inflationary deficit financing: in 2015, central bank monetisation of the government’s budget deficit measured 4.4% of GDP; last year it declined to 2.1% and in 2017 is expected to decline further to 1.7%. The government is targeting public expenditure/ GDP to fall 5.6pp from end-2015 to 2020 in order to bring the overall budget deficit closer to 3% of GDP from the 7.3% level posted in 2016 when the austerity-hit economy saw revenues decline and the budget deficit moved cyclically wider. Monetary policy. Critically from the perspective of the ARS, the central bank has tightened monetary policy significantly. The objective was to stabilise inflation and – over time – lower inflation expectations in the economy. Essentially, containing inflation is a critical success criterion of the government’s stabilisation plan. Tight monetary policy is particularly crucial in light of the maxi-devaluation of the ARS in 2015 as it can help reduce second round inflation effects. In addition, tight monetary policy can help stabilise and strengthen the ARS and thus prevent another wave of inflation stemming from a continued weakness of the currency, both via import prices and via the monetisation of the budget deficit. (A sizable portion of government liabilities are indexed to inflation). In essence monetary policy is focussed on stabilising and strengthening the exchange rate at a time when widespread scepticism towards the ARS embeds a sizable risk premium in the NDF curve. Our recommendation to take advantage of this policy framework was initially met with broad scepticism. On one level, there was a questioning of the political will of President Macri to maintain his classic stabilisation plan in light of the consequent hit to economic growth. Real GDP growth has surprised on the downside, falling by -3.7% and -3.8% Y/Y in Q2 and Q3 2016 respectively. (Chart 2.) However, the government’s immediate priority is not maximising economic growth but on taming inflation, which it views as the touchstone for future economic growth. For this reason we saw the rise in USD/ARS following the resignation of Finance Minister Pray-Gay (the figure-head for economic reforms) last December as an opportunity to add to long-ARS positions: as we noted at the time, Prat-Gay was actually pressuring the central bank to ease monetary policy with a view to supporting economic growth. 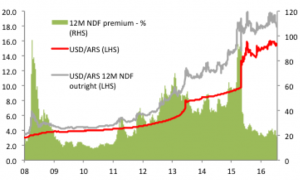 (Argentina and the ARS trade – can President Macri resist the siren call of populism?.) If anything, the commitment to policy stabilisation and maintaining a tight monetary policy is now stronger than it was. 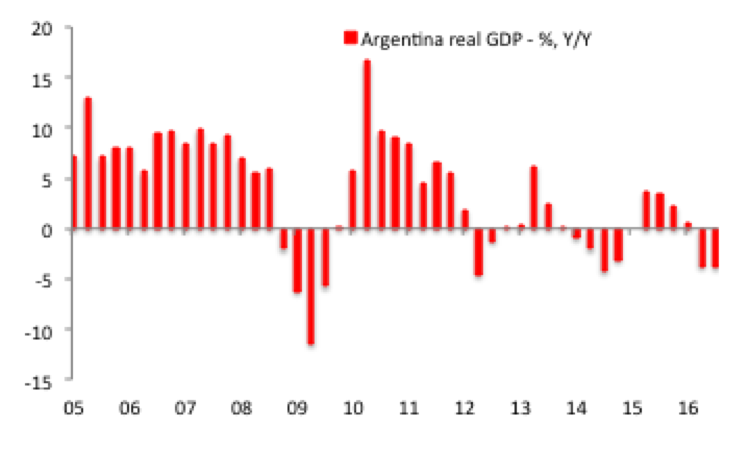 Moreover, given the low levels of private sector leverage in Argentina as a consequence of financial repression undermining the process of financial intermediation, the economy has a relatively strong capacity to withstand an extended period of high nominal and real interest rates. Another reason for the scepticism to our view is that with inflation having surged to over 40% following the maxi-devaluation, the ARS risks becoming once more an over-valued currency. There is clearly some virtue to this view, but the critical issue that investors need to focus on is that under a classic stabilisation plan a stable-to-strong currency once it has been floated is part of a process of taming inflation. Reduced external competiveness is a necessary consequence of this policy shift. The reduced competitiveness of the ARS is not an adverse by-product of stabilisation but an essential component of the policy platform. The stabilisation plan is showing signs of working. Critically, inflation – while still high – is trending lower. The Buenos Aires area CPI – the benchmark inflation measure until a newly creation nationwide series has a sufficient time-series – rose by 39.2% in 2016, but the pace of monthly increases is slowing: the average m/m increase over the past 6 months (August 2016-January 2017) has been 1.3% compared to 3.9% over the prior 6 months. Inflation is still on course to reach the government’s target of 12-17% in 2017. (It is targeting inflation to decline to 3.5-6.5% in 2019). (Chart 3.) As the stabilisation policies take effect and the front-loaded impact of aggressive fiscal and monetary tightening passes through the system, the economy should return to economic growth this year, and the IMF’s assumption of a 2.7% rise in real GDP does not appear unrealistic. While these are encouraging developments, it is clearly too early for the government to switch it’s policy focus from taming inflation and reigning in the budget deficit towards economic growth. Stabilisation policies are expected to characterise Argentina’s policy framework over the next 12-18 months, which will create a supportive policy backdrop for the ARS. We still see considerable value in being short-USD/ARS,even though the implied 12 month NDF yield has declined from ~20% when we first recommended to trade to 15.8% at present. (Chart 4.) We expect the USD/ARS to be at worst, stable over the coming 12 month, which would enable to carry in the NDF curve to be full captured. However, we also see the potential for the current appreciation of the spot-rate to continue and help generate 20% returns from being short-ARS. The appeal of the long-ARS trade goes beyond the expected return profile. The trade has broader portfolio benefits in terms of embedding a non-correlated position into a broader risk profile. The driver of the ARS trade is a domestic policy embrace of economic orthodoxy, and hence the position is less vulnerable to the vicissitudes of global policy and growth trends. Indeed, the importance of Argentina embracing fiscal austerity and economic stabilisation contrasts our criticism of G10 economies whereby fiscal policy is generally too tight and where policy is overly reliant on monetary easing. In short, the appeal of being short-ARS is in embedding a non-correlated and ~20% positive return trade within a broader portfolio. This entry was posted in Emerging Markets, Opportunities and Right Tail Events by Des Supple. Bookmark the permalink.